We have been working on internal software to allow rapid photomodelling in SketchUp. The software allows images to be rectified according to camera lens type to ensure height data can be accurately modelled and mapped in any 3D software package. Using this technique you can quickly model for applications such as Google Earth or game engines. At the moment we have made good progress with the Oblivion Engine, we will post a movie of this as soon as we can. 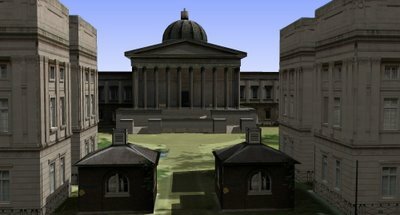 It is an interesting development route and hopefully opens up the ability to visualise architecture in games. How do you make these photo realistic models, I have made many sketchup models but I can’t figure out how to do these. geh4evr, I am curious to see how andrew and his crew did this in sketchup too, I am wondering if it is much easier than photogrammetry tools such as Imagemodeler or Photomodeler. I have used both Image Modeller and Photomodeler for projects and they both work fine, but they are slow. We turned to SketchUp as its obviously rapid modelling but the problem lies in its ability to place textures. You can manipulate them on a face, which is great but this is often at the sacrifice of accuracy. If you can simply recifiy a image and know how far away from the building you are when you took it, then you can work out heights. At the moment its a in house tool, but hopefully we will either release it or do a tutorial on how to follow the method in say Photoshop etc. Its not rapid modelling yet however, although it should be! The model took a week to build but this was mainly due to the learning curve and trying out new techniques. The main advantage is that unlike Photomodeller you dont need Oblique (Helicopter flown) shots to build the model. A movie of the model in Oblivion should be online early next week as well as the general output in Google Earth.